a web site dedicated to the Targa created by Aldo Lo Giudice. He kindly shared with us some of the pictures shown in this page. Below is what I found out about Alfas at the Targa Florio. 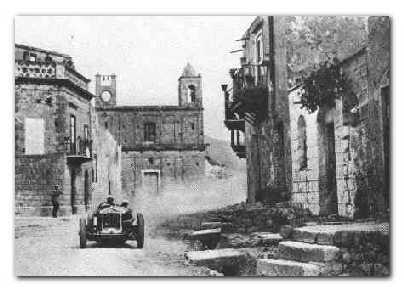 The involvement of Alfa Romeo in the Targa Florio started in 1920 when Enzo Ferrari, yes, the same Enzo who would become the world famous carmaker, raced an Alfa Romeo and set the fastest lap time in 2 hours, 5 minutes and 39 seconds driving on the Circuito delle Madonie (108 km) at an average speed of 51.571 km/h. Enzo participated in five editions of the Targa, from 1919 to 1923, with his best results being second in 1920. The famous driver Campari also drove an Alfa Romeo to third place in 1921. The first victory came in 1923, over 4 laps of the Circuito delle Madonie, for a total of 432 km. Ugo Sivocci won at the wheel of an Alfa Romeo RLTF with a 3 liter six cylinder engine. Despite Italian tradition associates #13 with bad luck, Sivocci won the race sporting # 13 on his radiator grille after contending the race with Steyr, Minoia and the formidable Antonio Ascari in a similar Alfa. In fact, Ascari dominated the race but he was the one with bad luck as his engine quit at the last turn even though his car was # 14. 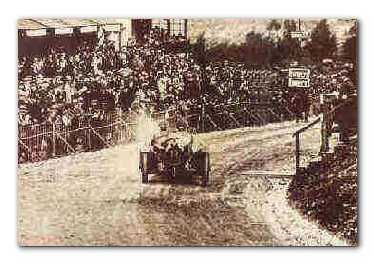 He managed to fire the engine again after 10 minutes, but by then Sivocci had taken the checkered flag. Sivocci won in 7 hours, 18 minutes driving at an average speed of 59.177 km/h. He was followed by less than 3 minutes by Ascari, who posted the fastest lap time in 1 hour, 41 minutes and 10 seconds at an average speed of 63.986 km/h. 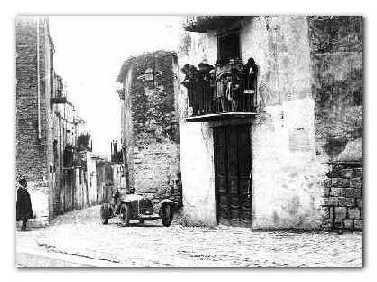 Two other Alfa RLTF models took part in the 1923 Targa Florio, driven by Enzo Ferrari and Giulio Masetti, who finished 4th. Masetti was known as the "Leone delle Madonie" (The Lion of the Madonie Mountains) because of his courageous and dramatic driving style. A wealthy and noble man from Tuscany, he won the Targa in 1921 driving a FIAT and again in 1922 with a Mercedes. He also finished 4th and 2nd driving Alfas in 1923 and 1924, respectively. His love for the Targa Florio was so evident that Sicilian fans had embraced him as one of their favorites. At the wheel of a Delage, he was battling for victory during the Targa Florio in 1926. While the Delage was powerful, brake failure was a probable factor in the fatal accident in which Masetti lost his life in a very demanding portion of the circuit, where true drivers would shine. Requirez wrote, "man like him, who die racing, never die". Bugatti and Alfa Romeo fought for supremacy at the Targa Florio for about a decade. The races between 1925 and 1929 were dominated by Bugatti, and the best Alfa could do was second place with Campari in 1928 and third with Brilli-Peri in 1929. Both races went into history for their intense competition. Among the participants of the 1929 edition was Madame Juneck, a pioneer lady driver, who even held the lead of the race in her black and yellow Bugatti. The reversal of fortune came in 1930 with 5 consecutive victories for Alfa Romeo. The great Achille Varzi broke the ice by taking first place and defeating the Bugattis of Chiron and Conelli in 1930. This was a legendary race, hardly fought against Bugattis aces Divo, Chiron and Conelli. Both Divo and Chiron were involved in accidents, but things were not going to be easy for Varzi either. During the last pit stop Varzi had the spare tires removed from his 175 HP supercharged 8-cylinder P2 to make it lighter, as it was a powerful but big and heavy car. In so doing the fuel tank was accidentally pierced, and after they resumed racing the engine started misfiring because of fuel starvation. Varzi ordered the mechanic riding with him to add fuel to the tank from a small spare container while they were racing. A few drops of fuel splashed over the exhaust pipes and the car was set on fire. Varzi did not stop fearing he may be passed by the Bugatti and crossed victorious the finish line with his P2 ablaze. Nuvolari and Borzacchini finished first and second both in 1931 and 1932. In 1931, Nuvolari drove a 2300 8C to victory in an epic battle against Varzi, this time driving a Bugatti. The battle was made even more intense by inclement weather, which had seriously worsened the already poor conditions of the 148 km road circuit. Under heavy rain and driving on roads that had become muddy and flooded, Nuvolari passed Varzi, whose car had no fenders and finished the race literally covered in mud. At the finish, Nuvolari awaited Varzis arrival, about 7 minutes later, and the two men shook hands, acknowledging each others greatness. Nuvolari simply was above anybody else in 1932. He took the lead from the start and drove his 8C 2.3 liter all the way to victory, never challenged by anyone, including Varzi who finished third about 20 minutes behind. The 1932 Targa was the first one disputed on the Piccolo Circuito delle Madonie (72 km), and Nuvolari won driving at an average speed of 79.355 km/h, a record that stood for 20 years. 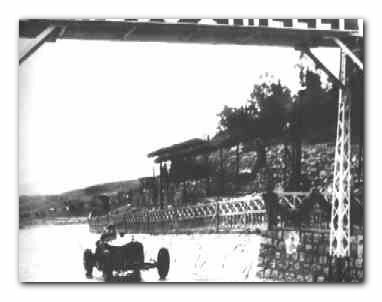 Three Alfa Romeo cars swept the podium in 1933, driven by Brivio, Balestrero and Carraroli. Alfa dominated and swept the podium again in 1934 and 1935. In 1934 Varzi was again the winner followed by Barbieri and Magistri. Brivio won once more in 1935 followed by Chiron and Barbieri. Note that just 12 years had gone by since the first Alfa victory at the Targa Florio, and Alfa had won 7 of those 12 races. Technical progress must also be noted here. The race of 1935 was disputed over the same distance of the one in 1923, and the winner completed the race in 5 hours, 27 minutes and 29 seconds, at an average speed of 79.149 km/h, much faster than in 1923. From 1937 to 1940 Maserati was the dominant marque at the Targa Florio, although the race was disputed over different roads, in the Circuito del Parco della Favorita, near Palermo. After WWII, from 1948 to 1950, it was raced as Giro di Sicilia driving around the island. Alfa returned to victory in 1950 with Bornigia-Bornigia, followed by the Ferraris of Bernabei and La Motta. The Targa returned to the Piccolo Circuito delle Madonie in 1951. In 1952, Felice Bonetto in a Lancia Aurelia B20 barely improved Nuvolaris record winning at an average speed of 80.025 km/h. The following years were dominated by Lancia, Mercedes and especially Porsche and Ferrari. Those years also saw legendary battles of incredible drivers and ever more powerful machines. 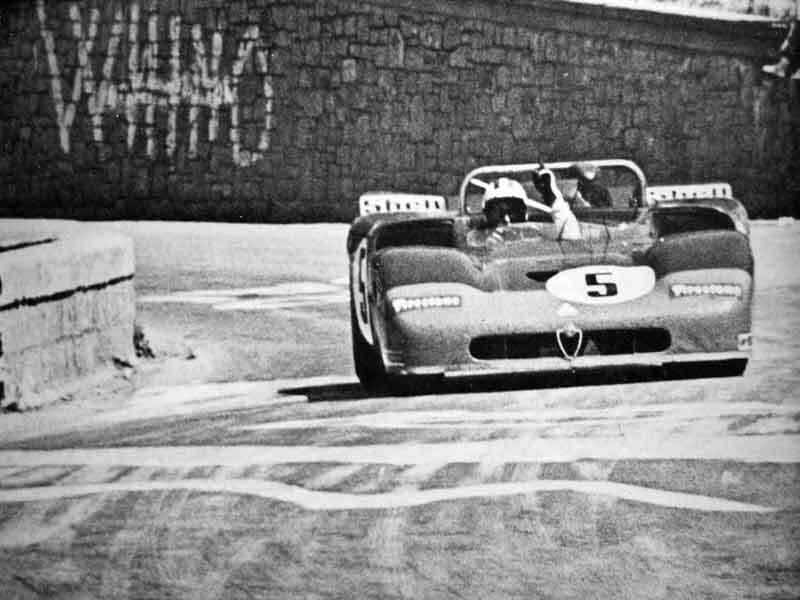 In those years Alfa did not have a car in the prototype category. Yet a Giulia TZ1 finished third overall in 1964 driven by Businello and Todaro. Carlo Chiti, the man who designed many of the Ferraris that won the Targa and other races of the period, then moved to Alfa Romeo and became the Director of Autodelta, Alfa's racing department. Chiti's arrival lead to the return of Alfa Romeo among the top contenders with the 1967 33 model. In 1968, the 33/2 cars of Giunti-Galli and Casoni-Bianchi finished second and third, while the race was won by Elford-Maglioli in a Porsche 907. This was an astounding victory, conquered with an all-out drive after Elford had to stop along the circuit to change a flat tire. To everyone's surprise, he made up the lost time and passed both Alfas on his way to a deserved victory. Alfa Romeo was back in contention in 1969, but victory went to Porsche once again. The car driven by Giunti-Galli was involved in an accident with Elford while the one driven by Vaccarella-De Adamich retired with engine failure. By 1970 the Targa was extremely popular and massive crowds were in attendance to witness the epic battles involving Ferrari, Alfa Romeo and Porsche. The main contenders of the 1970 race included drivers such as Siffert, Elford, Rodriguez, Redman, Van Lennep, Larrousse, and Kinnunen (Porsche 917/980/908), Vaccarella, Parkes, Giunti and Muller (Ferrari 512 S), De Adamich, Courage, Galli, Maglioli and Hezemans (Alfa Romeo 33/3). Siffert won the race with his Porsche, followed by Kinnunen and finally Vaccarella with the Ferrari, who was in the lead for many laps but was heavily penalized by the frequent refueling stops required by his thirsty Ferrari. 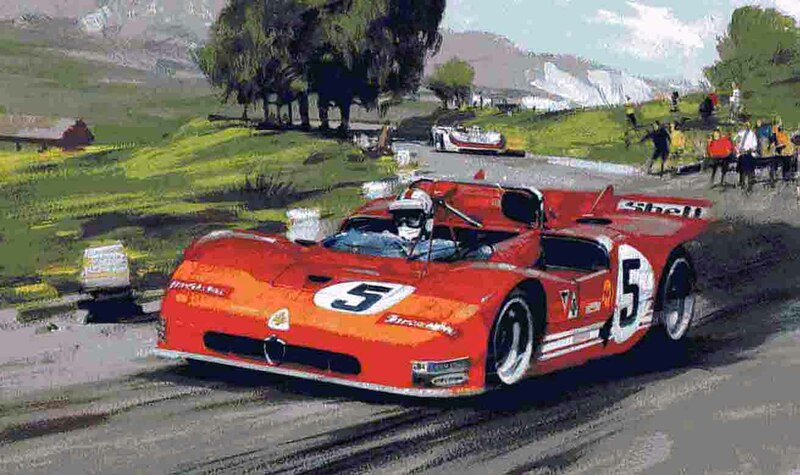 Vaccarella got his second Targa victory in 1971, this time driving the Alfa 33/3. A legendary battle unfolded between the nimble 908s (550 Kg, 360 HP) and the more powerful but heavier 33s (630 Kg, 420 HP) in front of about half a million people. Redman and Rodriguez started furiously with their Porsches and both crashed their cars. Ironically, Rodriguez lost control of his car in the town of Collesano, driving over the sign "Viva Porsche" painted on the asphalt. Meanwhile Vaccarella had passed the leading Porsche of Larrousse and handed over his car to his team mate Hezemans, but Elford relinquished his drive from Larrousse and puts his magic to work to regain the lead. He was flying through the Madonie Mountains when a flat tire forced his Porsche to retire. Alfa Romeo conquered the Targa Florio again, finishing first with Vaccarella-Hezemans and second with De Adamich-Van Lennep. In 1972 Ferrari returned to the Targa with a single 312P driven by Merzario and Munari, two excellent drivers. Merzario will later on become a Formula One driver while Munari will win the World Rally Championship with the Lancia Stratos. Alfa Romeo returned in full force with 33/3 cars for Vaccarella, Stommelen, Van Lennep, De Adamich, Hezemans, Galli, Marko and Elford. Elford took the lead in his usual "all-out" style but damaged the car during the first lap and had to retire. Merzario then took the lead with the powerful Ferrari. Vaccarella chased him, but his engine failed. Helmut Marko picked up the fight and overtook the Ferrari now being driven by Munari. Marko was flying, and his Alfa posted the fastest time Marko (33 minutes and 41 second, average speed of 128.253 km/h, a record still standing). Another drivers swap meant another lead swap. Merzario, now back in the driver seat, was faster than Galli, who replaced Marko. Galli even went into a spin and lost over a minute. When Marko got back in the Alfa he was far behind the Ferrari. Yet he attacked without reservation and closed down on Merzario only to finish 17 seconds behind Merzario. There was much criticism about how Alfa lost the 1972 Targa to Ferrari. Certainly the loss of the cars driven by the leading drivers (Vaccarella, Elford) and some tactical mistakes related to the timing of the pit stops were major factors. Nonetheless, Alfa showed how fast and competitive uts cars were. In 1973 the Targa Florio was run for the last time as a World Championship race. Cars had reached an unprecedented level of technical sophistication, which combined with the much-improved conditions of the roads, allowed for very high speeds in too close proximity with a very large crowd. Safety was a concern and the authorities decided that a World Championship race could no longer be disputed in such conditions. The race was very important for the championship and Ferrari sent two cars for the pairs Ickx-Redman and Merzario-Vaccarella. Alfa had brought to Sicily the brand new 33tt12 for his official debut. De Adamich-Stommelen drove the car. Clay Regazzoni, soon to become a Ferrari Formula One driver, was supposed to drive another 33tt12, but he destroyed it in practice near Polizzi. At the start of the race Merzario and his Ferrari took off like a rocket followed by the aggressive Stommelen in the Alfa. A flat tire near the longest straight (Buonfornello) delayed Merzario a great deal. He got the tire replaced and started hammering on again but a broken axle forced him to retire, even before Vaccarella could get in the car. Ickx's Ferrari also retired after he lost control and damaged the car. The Alfa Romeo of De Adamich-Stommelen seemed poised for victory when it too succumbed to a silly racing accident caused by a misunderstanding between De Adamich and the driver of a Lancia Fulvia. The smaller Porsche Martini Carrera RSR of Muller and Van Lennep fended off Munari in a Lancia Stratos and drove to victory, while Ferrari lost the World Championship. Alfa came home with the fastest lap time set by Ralf Stommelen at an average speed of 126.248 km/h. Following 1973 the Targa Florio was disputed only as a national event, with much lesser resonance. Privateers replaced the main official teams and prototypes were mostly those used in hill climb races, such as Chevrons, Osellas, etc. In 1975 Alfa Romeo scored its last victory at the Targa Florio with a 33tt12 driven by Vaccarella and Merzario. For those of us driving 1970s GTV it may be nice to remember that in 1976 the pair Donato-Donato finished 5th in an Alfa GTV 2000. The Targa Florio as a road race finally came to an end in 1977, when the concerns about safety proved to be true. 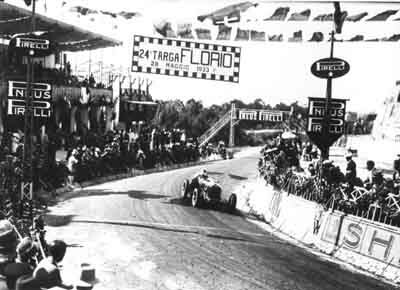 The race was stopped after five of eight scheduled laps following an accident that resulted in the death of several spectators. 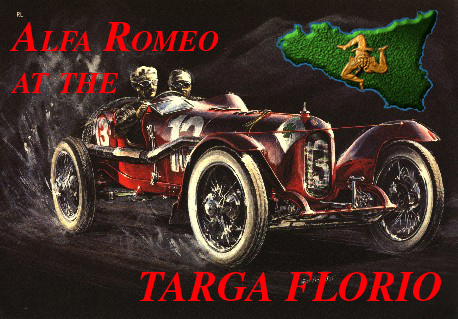 The Targa Florio had outlived the Mille Miglia of 20 years, but it too had to come to an end. In its long history as a road race, however, Alfa Romeo had played a prominent role with many prestigious performances and overall victories though the talents of unforgettable drivers and superb machines.